Does your dog ever suddenly begin rubbing his head and face all over you for some strange reason? You may think your canine friend just wants to clean his face of whatever he was eating or drinking, or perhaps it’s a sign of affection or even a territorial marking of some sort? Or does this action mean something altogether different from what you’ve been thinking? In order to understand what drives a dog to initiate certain actions you must keep the situations in context. For instance, if this is a first meeting between canine and human, the dog will respond first with scent. At this juncture of the introduction you should avoid eye contact and simply allow the dog to sniff you. If you pass the sniffing test, he’ll probably move on to possibly nuzzling you or rubbing his head against you as an invitation for you to reciprocate your affection. 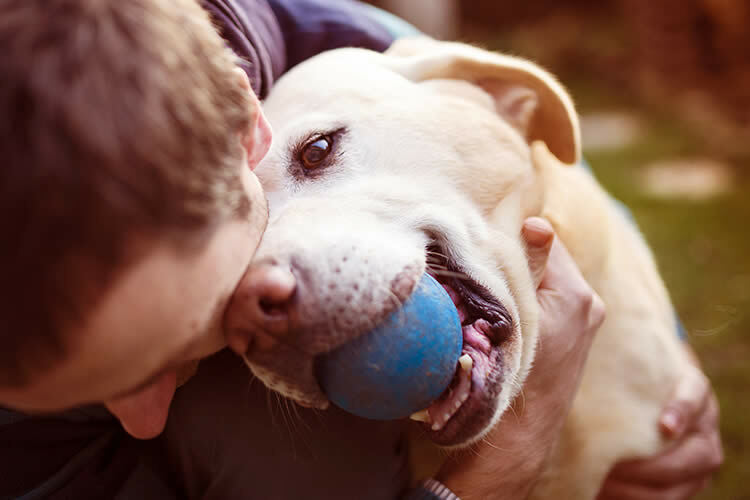 Scent glands are located in the dog’s facial area, so it makes sense to reason that your dog is marking you as “territory” when he rubs his face against you. So marking you as territory may be your dog displaying his ownership of you! This could become a dangerous situation if you allow your dog to become the alpha in the house! You may want to hurry to the vet or Humane Society for aid in any type of relationship issues you’re having with your dog. Being pack animals, dogs will naturally look to their owners for guidance. Like stated above, you should be the alpha/pack leader, not your dog. If you’ve failed to set boundaries and have pampered your dog way too much, your dog may try to take over by rubbing against you when you step into your dog’s space. So if your dog’s legs appear stiff while his cute face looks like a grumpy grandpa, what you’re seeing is tension. The solution – obedience training! A dog’s skin sometimes becomes dry and when that occurs it’s also accompanied by itchiness. So if a dog has an itch, of course, it reasons, my owner is here to scratch that itch! So give your dog a good scratch and while you’re at it, check him over for skin dryness while observing him closely. If he appears irritated and his coat smells bad, then it’s time to call the veterinarian for an appointment. Dogs rubbing themselves against other objects or people is a normal canine behavior – if cats can do it why can’t dogs? In most cases, dogs rub against things to mark them and their territory. They’re saying to the other animals , “this is my turf…stay of out it.” Unfortunately this behavior can also be learned. Have you ever given your dog a treat for rubbing against you? Think about it. If all of the above reasons simply do not answer the question as to why dogs rub their faces on you, well it might be just to say, “Hey, I’m here, look at me!” Dogs are always looking to you for love and support. Pet in Life: Behaviour: Why Does My Dog Always Rub Against Me?